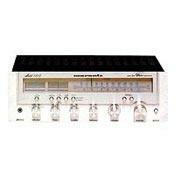 Receiver with 18 watts power per a channel, FM range: 87.5 - 108MHz, AM range: 525 - 1605KHz. Input selector, possible to choose speaker mode. Additional features: bass and treble controls, loudness control, signal strength level and FM tuning indicators, balance control, jack for headphones. Low filter. Weight 9kg. In a model 1515L available LW with a range: 150-350 kHz. Summary: I've been using this receiver now for over a month and feel I have enough insight to review it. I have mounted this in the kitchen for my wife who is primarily concerned with FM radio. For this application, its a perfect receiver. Obviously, I got this for a steal so in terms of value, it can't be beat. Of course, like most top of the line vintage gear, the power rating is VERY conservative on this unit. It has powered the JBL L110's and the Avant 715's quite nicely. I have only hooked up one pair. If your a volume and power junky, stop reading and move on. If you don't mind moderate volume with great tone and clarity. The 1515 is full of it. The radio tuner is superb and if you like FM radio, this amp is great. There seems to be an incredible boost in volume and clarity when using the FM tuner. The most noticable quality is the deep, rich tone. No portable or shelf system can even begin to touch the 1515. If you're a radio type, this amp will be a great buy for you. I found the phono input to be the next most pleasing point. I have a Pioneer PL-516 through a Bellari VP 130 and the sound is second to none. Great clarity all through the frequency range, with a nice warmth and tone. I have inputed my DAC, a Firestone Spitfire, into the aux input but was not impressed. It is possible that the inputs need servicing, however with the rest of the amps condition being so good, I doubt it. The 1515 seeemed to have a hard time seperating and the low end response was quite dissapointing. If didgital application is what you're into, look elsewhere. Aside from this, the look of this receiver is great. Silver with an icy blue glow from the lamps. Superb build with quality parts. If you are a DIYer, this could be a great and fun piece to refurb. The overall sound of the 1515 quite surprised me and is proof that 15 watts RMS can be a fine thing. As I already stated, this amp is for those who appreciate sound and clarity at moderate volumes. I hope this helps anyone who may be thinking about a purchase. Just remember, don't pay good money for this amp unless it's in top shape and even then, it's probably worth about 40-50 bucks. If someone is asking alot, move on or add a little to their asking price and bump up to the 2220.